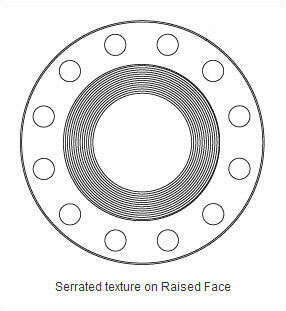 The most widely used of any flange surface finish, because practically, is suitable for all ordinary service conditions. Under compression, the soft face from a gasket will embed into this finish, which helps create a seal, and a high level of friction is generated between the mating surfaces. The finish for these flanges is generated by a 1.6 mm radius round-nosed tool at a feed rate of 0.8 mm per revolution up to 12 inch. For sizes 14 inch and larger, the finish is made with 3.2 mm round-nosed tool at a feed of 1.2 mm per revolution. This is also a continuous or phonographic spiral groove, but it differs from the stock finish in that the groove typically is generated using a 90-deg tool which creates a "V" geometry with 45° angled serration. This finish shows no visually apparent tool markings. These finishes are typically utilized for gaskets with metal facings such as double jacketed, flat steel and corrugated metal. The smooth surfaces mate to create a seal and depend on the flatness of the opposing faces to effect a seal. This is typically achieved by having the gasket contact surface formed by a continuous (sometimes called phonographic) spiral groove generated by a 0.8 mm radius round-nosed tool at a feed rate of 0.3 mm per revolution with a depth of 0.05 mm. This will result in a roughness between Ra 3.2 and 6.3 micrometers (125 - 250 micro inch).